Set on fictional islands off northeast America in 1787, this story features two twelve-year-old girls from different cultures – one a native islander and one English – who join forces on a journey to save themselves, their people, and one special baby. It is part historical (based on convicts who were sent to the Americas before the Revolutionary War and Australia’s history) and part fantasy (the land holds magical properties). Above all, it’s a captivating adventure in the tradition of The Princess Bride – with shipwrecks, curses, chases, murder plots, kidnapping, rebellion, narrow escapes, magic (of all kinds), romantic legends, thieves and politicians (sometimes both), a caring school teacher and a handsome horse groom, a pair of feisty (sometimes difficult heroines, and the mysterious power of storytelling at its center! Please join me in welcoming Heather Bouwman to KidLit Central. Julie: Hi, Heather! Thanks for being with us today. I’ve read your book and I’m happy to report that all the nice things people are saying about it are very true! Heather: Thank you! It’s great to be here at KidLit Central—thanks for inviting me. Julie: Before we begin talking about Lucy and Snowcap’s story, I wanted to say how much I love the cover art for the book. I think it’s absolutely lovely and marvelous in that it holds several small (but significant) details that my eye didn’t catch at first glance. How did you feel when you saw the art for the book? Heather: Well, here’s the dementedness of human nature for you: I was initially a little disappointed. I’d been envisioning Garth Williams-style line drawings or (even better, I thought) an eighteenth-century style cover with fancy gold lettering and no illustrations. (Yeah, I’m not a marketing person….) But about ten minutes after I saw the cover, I started to like it—and people keep telling me how much they love it. So I’m very happy with it. The artist, Nicoletta Ceccoli, has done quite a few children’s books and is a very talented artist. Julie: The story takes place in 1787 on a cluster of thirteen islands off the New England coast where three British ships, carrying convicts, shipwrecked in 1775. What about that particular time period appeals to you? Heather: I wrote my dissertation on colonial American literature, especially texts by and about Native Americans. I’ve been long interested in the literature of exploration and colonization—which certainly fed into this novel. Then, when I was researching my dissertation, I wandered off on a tangent reading about convict transportation to the American colonies—none of which made it into my thesis. But I knew that somehow convicts had to be an important part of the novel. Julie: The islands’ original inhabitants – the Colay – are forced to live on tiny Sunset Island after the British overtake the large Island of Tathenn. Tell us a bit about the islands and how the setting came to be. I love islands. Not tropical paradise kinds of islands—though these are great, too, I’m sure—but big woods, cold water kinds of islands. Islands with eagles and bear and old growth forest, islands where you swim at the risk of hypothermia. The islands in the novel are completely made up, of course. But for me, at their core they resemble the Apostle Islands. Julie: As the title suggests, portions of the novel are “very true” and other portions are “remarkable.” Historically speaking, in what ways is the novel very true? Heather: There really were convicts who were sent to the American colonies in the 1700’s—in some places (most notably Virginia) these convicts were a substantial percentage of the white settlers; and they’ve been largely ignored in American histories. I wanted to bring back their memory. And many of the convicts in the book (Philip, Snowcap’s parents, Adam’s grandmother) were modeled in part on real convicts. But the novel is fiction, of course, and not meant to be historically accurate. As for how it portrays colonization, it’s more alternative history than historical fiction—a “what if” kind of story. Julie: The story is also “remarkable” – indeed, fantastical. 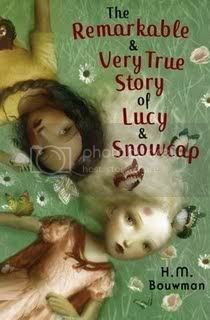 Tell us about the fantasy-elements that are woven into Lucy and Snowcap’s story. When you began writing the book, did you imagine that it would contain both history and fantasy, or did one element (or the other) emerge as the story developed? Heather: The book started as straight fantasy—there were no convicts, no English, just Lucy and her island village and this baby boy who was turning to stone. Pretty quickly I realized I didn’t know why the baby was transforming, or exactly how Lucy was going to save him. Luckily, I was reading about convicts at the time; and one thing led to another…. When the girls’ paths first cross, they heartily dislike each other and see their journeys as separate and distinct. What would you say the girls are searching for, individually and collectively? Heather: I’d say they’re both searching for love, though neither of them would admit this at the beginning of the book; I’m not sure they’d even admit this at the end of the book! They want to know that they are loved and important and special—just for being themselves, just as they are. They also both want, in a sense, restitution: Lucy for her people’s mistreatment, and Snowcap for her parents’ deaths. But restitution—and its shadow twin, reconciliation—is something they can only find together, collectively; it can’t be gotten alone. The trick for me was to get them to work together and to trust each other without forcing them to be friends—because I really don’t think they’ll ever be bosom buddies. Julie: What was the research and writing process like for you? Heather: Long! When I began writing I had no idea what I was doing or how to write a book, and I wrote a draft and pretty much shelved it away for years. When I moved to Minnesota—and especially after I had my second child—I got more serious about my writing and revised the book and started sending it out. But I think my growth as a serious writer didn’t begin until I connected with other writers—at The Loft Literary Center (in Minneapolis) where I took classes and participated in the Mentor Program there; by joining SCBWI and the Children’s Literature Network; by joining a critique group; and by networking with other writers and learning from them. Julie: And your path to publication? What was that like? Heather: Again, long—but good. When I sent the manuscript to Marshall Cavendish, it was on the basis of an interview I’d read with Margery Cuyler; I thought she sounded nice, like someone who’d send a kind rejection letter! And her assistant did, in fact, respond with a rejection—and it was kind—the nicest rejection I’ve ever gotten. After telling me (for over a page) all the things they didn’t like about the novel, the assistant said something like this: If you’d like to revise and resubmit, we’d be happy to look at the manuscript again. Wow! So of course I did that, and then I heard back from Robin Benjamin, who was later to become my editor, who wrote to say that she had some comments for me and would I be interested in receiving them? I said, “Of course!” And then Robin sent me copious line edits as well as a longish editorial letter; and I did another round of revisions. THEN I received a contract from Marshall Cavendish—almost two years after I’d originally sent them the manuscript. After that: more revisions. The short version of the story is that the manuscript was taken off the slush pile; but the reality is that I had to do a lot of work to move from the slush pile to the contract. But it was well worth it; the book is FAR better because of Robin’s careful and insightful editing and my subsequent revisions. Robin is a dream editor. Julie: Well, now we know who your favorite editor is! How about your favorite authors? Heather: There are so many…! Among children’s authors, one of my favorites is Joan Aiken, and in Lucy & Snowcap there are moments where I felt like I was writing an homage to her. I love Aiken’s sense of alternative history—and I first learned what an oubliette was from reading The Wolves of Willoughby Chase. But I have other favorites authors, too (not in any particular order): E.B. White, Edward Eager, E. Nesbit, Christopher Paul Curtis, Gary Schmidt, J.K. Rowling, Frances Hodgson Burnett, Roald Dahl, M.T. Anderson, Shannon Hale…I could go on and on. How have your favorite authors/novels influenced your writing? 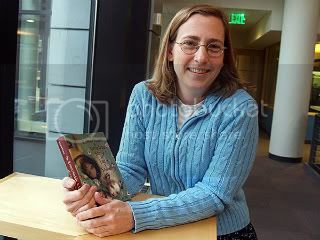 Heather: With Lucy & Snowcap I was trying to write a multi-plotted novel (think Dickens) as well as a story with an intrusive narrator (think Princess Bride)—though the narrator got toned down a lot by the final version of the novel. With my more recent writing I’m trying to be more spare, more E.B. White. I’m starting to realize—what my dissertation director tried to teach me so many years ago—that more words aren’t necessarily better. And I’m trying to be funnier—which is a lot harder than you might think. Julie: Think it, know it, live it. :) Do you have any words of advice for those who are interested in writing historical fiction, fantasy, or both? Heather: With both fantasy and historical fiction, one could keep researching and outlining the world of the book forever. At some point you need to stop doing that and just start writing. Write. Trust that when the time comes you’ll have the information you need. Julie: Aside from writing novels for children, what other interests keep you busy? Heather: I like to read….! I also spend a lot of time hanging out with my two sons. I practice a traditional Korean martial art. And I work full-time: I’m a college professor—I teach literature and writing at the University of St. Thomas (in St. Paul, MN). There are a lot of other things I like to do, too—cook, travel, watch movies, count the stars, clean house—but I rarely have time to do them, mainly because I need to sleep. Okay, I’m lying about cleaning house. I don’t like cleaning, and I’m GLAD I’m too busy to do it…. Julie: Busy is right! But, thankfully, not too busy to give us such a captivating novel. Do you have any new writing projects in the works? What can we look forward to from you in the future? Heather: I’m working on two very different projects right now—a young adult historical piece and a short, contemporary novel for younger readers. I hope you’ll see one or both of them sometime soon! Julie: I’m sure we will, Heather! Thanks again for sharing your story with us. We wish you and Lucy & Snowcap much happiness and success! Heather: Thanks so much, Julie!